Built to Last became an instant business classic. They set out to determine what's special about "visionary" companies—the Disneys, Wal-Marts, and Mercks, companies at the very top of their game that have demonstrated longevity and great brand image. The authors compare 18 "visionary" picks to a control group of "successful-but-second-rank" companies. Thus Disney is compared to Columbia Pictures, Ford to GM, and so on. 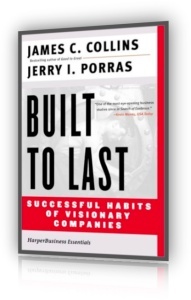 A central myth, according to the authors, is that visionary companies start with a great product and are pushed into the future by charismatic leaders. Usually false, Collins and Porras find. Much more important, and a much more telling line of demarcation between a wild success like 3M and an also-ran like Norton, is flexibility. 3M had no master plan, little structure, and no prima donnas. Instead it had an atmosphere in which bright people were not afraid to "try a lot of stuff and keep what works." This book, written by a team from Stanford's Graduate School of Business, compares what the authors have identified as "visionary" companies with selected companies in the same industry. The authors juxtapose Disney and Columbia Pictures, Ford and General Motors, Motorola and Zenith, and Hewlett—Packard and Texas Instruments, to name a few. The visionary companies, the authors found out, had a number of common characteristics; for instance, almost all had some type of core ideology that guided the company in times of upheaval and served as a constant bench mark. Not all the visionary companies were founded by visionary leaders, however. On the whole, this is an intriguing book that occasionally provides rare and interesting glimpses into the inner workings and philosophical foundations of successful businesses. Randy L. Abbott, Univ. of Evansville Lib., Ind. Copyright 1994 Reed Business Information, Inc.—This text refers to the Hardcover edition. Companies become visionary primarily through "vision statements." Origins: Who is the Visionary Leader at 3M? Step 1: What Companies Should We Study? Step 4: Crates of Data, Months of Coding, and "Tortoise Hunting"
The Myth of the "Great Idea"
Is There a "Right" Ideology? BHAGs and the "Postheroic Leader Stall"
Stick to the Knitting? Stick to the Core! I'm Not CEO. What Can I Do With These Findings? Is There Hope for Old, Large, Non Visionary Corporations? Are There Any People Who Can't Build a Visionary Company? How Does Your Book Fit Other Works, Such as in Search of Excellence? Is "Visionary" Just Another Word for "Successful"? Can We Trust the CEO Survey to Give Us the Right Companies? Also see Good to Great: Why Some Companies Make the Leap … and Others Don't content outline.